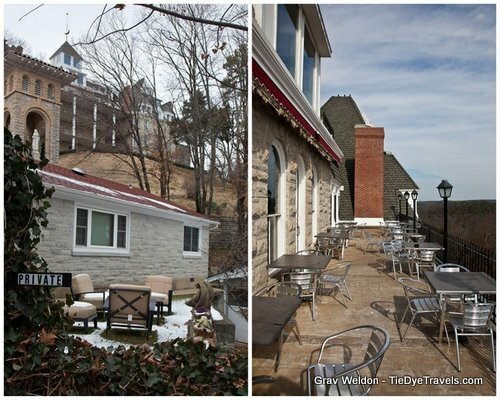 Sleep at the Highest Point in Eureka Springs - the North Penthouse at the 1886 Crescent Hotel & Spa. Want to stay somewhere with real bragging potential? 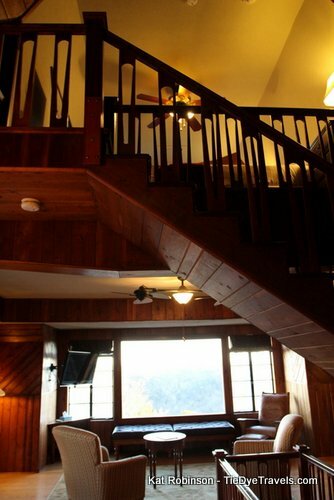 How about the highest bed in Eureka Springs? 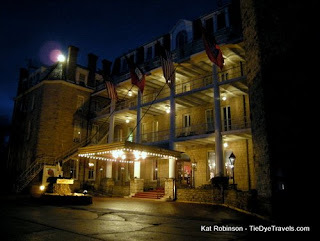 You’ll find it at the 1886 Crescent Hotel in Eureka Springs. 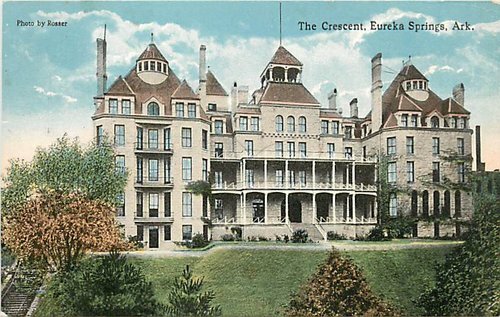 The Crescent was originally built as a resort financed by the Frisco Railroad and the Eureka Improvement Company. Over the decades, it’s served as a college for women, a junior college and a health resort before closing down. 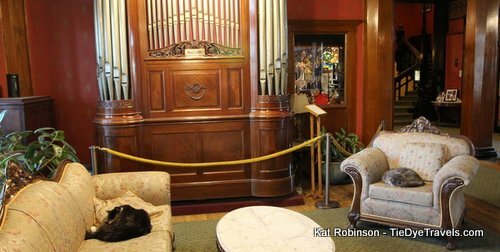 In 1997, Marty and Elise Roenigk bought the old hotel and began five stages of renovation. Today, the hotel is considered a top lodging option in the city, and it’s known as the Most Haunted Hotel in America by many sources. The Crescent is already pretty tall. 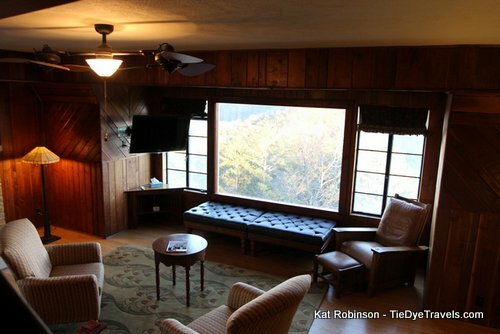 It sits opposite Christ of the Ozarks on opposite sides of the valley where downtown Eureka Springs lies. The hotel can be seen for many miles around. 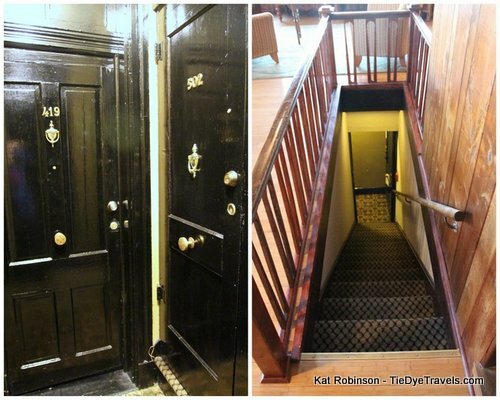 It offers a total of 76 rooms, most of which are on its bottom four stories. There’s one room, the South Penthouse, on the 5th… and then there’s this. On the north end of the Crescent on its fourth floor, at a bend at the end of a hall, you’ll find two doors. One takes you into room 419. The other, 502, opens to a stairwell that will take you to the fifth floor. On this level, there’s a full living room with fireplace, dining room, small bar with microwave and refrigerator, and a full bath. And there’s another staircase. This one will take you to a king sized bed in a parapet. 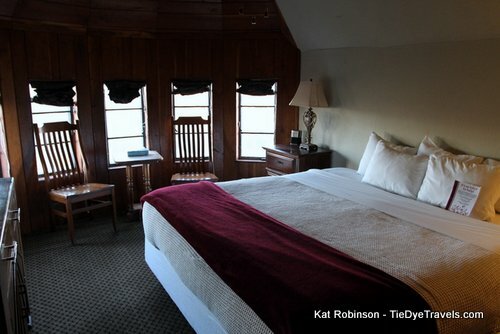 This lofty location is the bedroom of the North Penthouse, and it’s the highest bed in all of Carroll County. 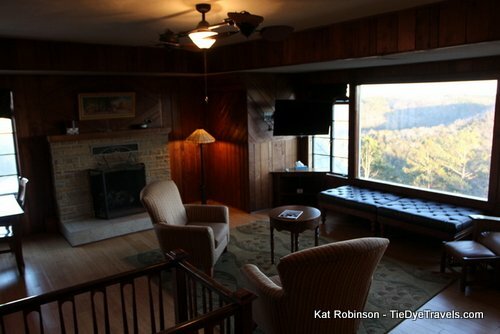 A fan keeps the air circulating from below, and there are chairs, a dresser, a full sized mirror and even a television for your enjoyment. What’s lacking is a headboard and footboard – which were likely too bulky to bring up the tight turning staircase. In the evening, as the sun is setting, the Christ of the Ozarks statue in the distance is brightly illuminated over the darkening valley below. In the morning, light streams towards the foot of the bed (the head of the bed is on the south wall, so no light right into your eyes when you first wake up). There are few vantage points this lofty in the entire county. The gas fireplace is excellent in the cooler months, both to heat the space and for the ambiance. Turn a chair and ottoman towards it for a prime spot to read a book and relax with your loved one. In the morning, head downstairs for breakfast in the Crescent Dining Room. 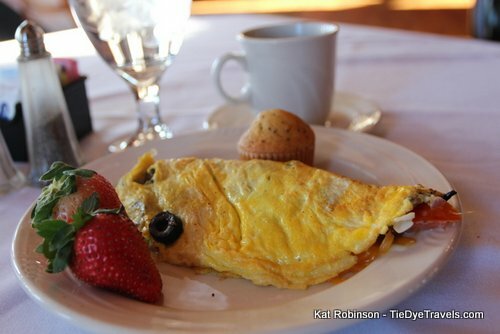 While there are buffet options, made-to-order omelets are included in the price and come highly recommended. And while you’re staying at the Crescent, be sure to say hello to Jasper and Casper, the hotel’s resident cats. 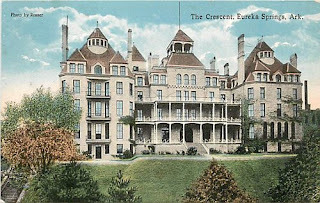 For more information, check out the 1886 Crescent Hotel and Spa website. Learn more about Casper and Jasper here.